Nothing is more important than hearing, understanding and obeying God's Word. Our lives and local churches depend on this for their life, health and growth. John Stott is well known worldwide for the commitment he had to the Bible, both in his preaching and in his living. In this persuasive book, Stott concisely demonstrates the power, authority and relevance of the Bible for every Christian - in every culture and generation. What is the purpose of God's Word? How does it point us to Christ? What is its relationship to the Holy Spirit? How does it shape the church? And what does it mean for Christian discipleship? 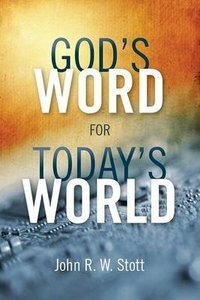 The author answers these questions with simplicity and clarity, urging us to hear and obey God's Word in today's world." About "God's Word For Today's World"